in their search for gold. to raid that trembling land. to make the bravest pale. for pillage and treasure sweet. and made Tiree their base. in the glen, for them to face. many killed and captured men. 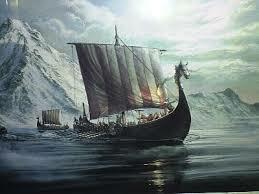 now only thirty Vikings strong. their treatment was hard and long. and in that land, they fared. close by the Liffey’s mouth. now Irish or Scottish true. so I’m an Englishman instead. from the Irish, poetry too. but that is probably true of you.